This week, Cliveden Conservation Conservator, Andrea Walker, talks us through the restoration work taking place inside the Folly. With the colder, wetter, winter weather descending upon us, our Wood Conservation Team seems pretty pleased with themselves – they’re the only ones working indoors! Working their way down, level by level, they are repairing and reinstating the floors inside the Main Tower. The safest access is via the Prospect Room window. Luck for us, the stone tracery was missing and we were able to install a temporary door there. 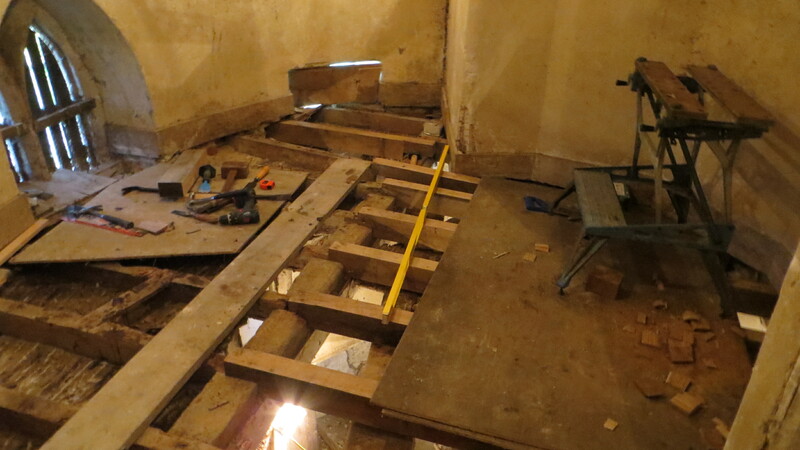 But with this as our only point of access, it has been tricky getting these lovely new long oak joists up and in through the space. Because space is limited and for safety reasons with the lack of floors, we’ve kept the wood team to a maximum of 2 people while working inside the Tower. 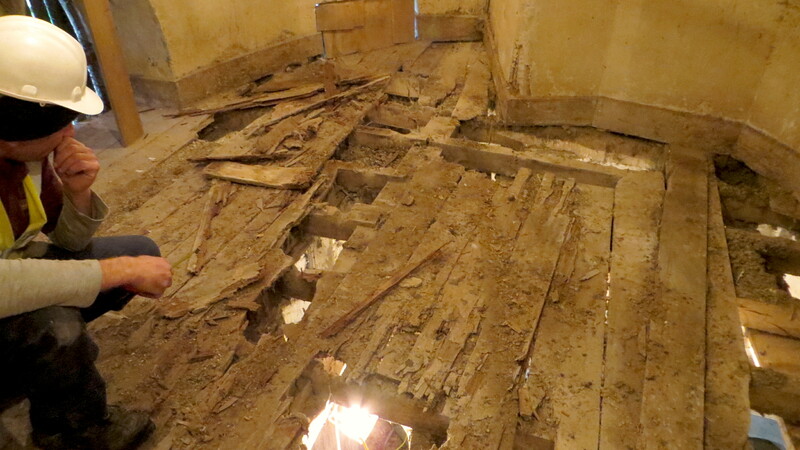 The process is similar for each floor: open up the floor by clearing off all the detritus, clean floorboards if they exist, clear out between the joists, survey the timber, discuss and agree a method to preserve as much of the original timberwork as possible, measure up, order the materials and do the work. In the opening up process, I’m sorry to say we haven’t come across any “concealed items” (such as shoes, newspapers, coins or dead cats). 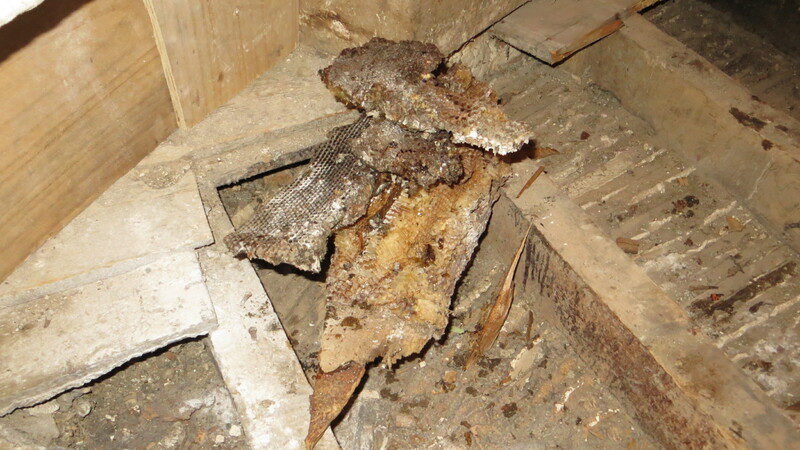 So far we’ve it’s been more pigeon poo (if you’ve been following The Folly blog you’ll know why this is not surprising) and more general detritus than anything else, however, in the floor below the Prospect Room, we discovered a large beehive. 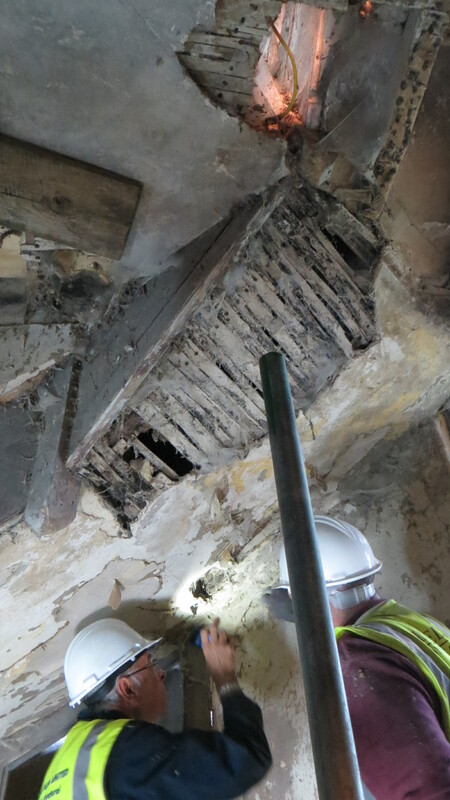 Initially it was thought to only be located at the mouth of an open arrow slit in the room, but once the floorboards was up, it was evident the honeycombs extended as far back into the room as the landing, sandwiched between 2 joists. Beautiful! And it smelled lovely! But once the bees started to swarm…It did mean that, until the bees were removed, the Wood Team had to join the rest of us outdoors. This entry was posted in Buildings, Conservation, Landscape and tagged bees, conservation, floorboards, Folly, wimpole by ntwimpole. Bookmark the permalink.